Site Name and Description: Anderson Cooper 360. The CNN blog of Anderson Cooper and his show Anderson Cooper 360. The site has a full range of topics from politics to tech to travel. 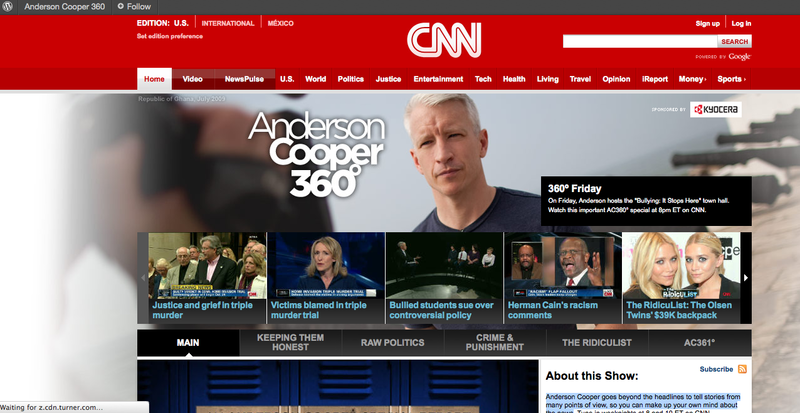 The home page focuses on Coopers’s show, while the rest of the navigation draws on CNN’s resources. Design Overview: The design is consistent with CNN’s brand with the CNN logo in the front center of the navigation bar, which is in the CNN red. Not surprisingly, the site features photos and video clips of Cooper’s stories. It has a lot going on but it seems appropriate for a news site. Audience: The main stories on the site are about bullying, the “Occupy Wall Street” movement, and other liberal issues so that is probably the target audience. The interactivity of the site appeals to a younger audience but the content skews a little older, overall it probably appeals to a broad audience (20s-50s). Business/Site Goals: The site aims to continue the show online and offers many interactive features for that purpose. There are also advertisements to encourage people to watch the show and other CNN programming. Reviews found were for television broadcast, not website.